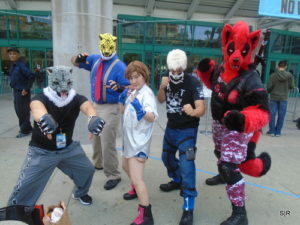 This panel featured six of the classic wrestlers from the enjoyable campy 80s wrestling brand. The panel featured: Sunny, Lightning, The Royal Hawaiian, Angel, MTV, and Hollywood all of whom had great stories to share. 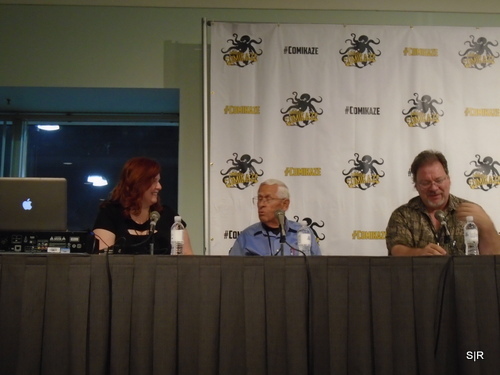 The panel began with a video, but technical difficulties made it a little less fun to watch. After that the panelists introduced themselves and talked a little about their experiences. Then it was opened to audience questions where the ladies talked about their feelings on the Netflix show, their favorite matches, and the craziest things they did in the ring. 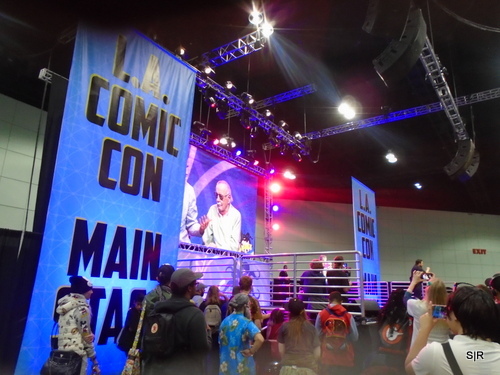 The panel was closed with the ladies discussing their After GLOW cruises where fans can go on a cruise with several of the original cast GLOW wrestlers and hear more about their behind the scenes shenanigans. This was a great panel not only for fans of the original series, but for those who have been newly introduced via the documentary or Netflix show. One of the most successful animated series in the west, Steven Universe, brought in a lot of fans to LA Comic Con ’17. 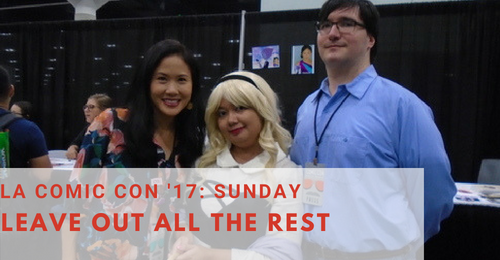 Michaela Dietz, Zach Callison, and Dee Dee Magno Hall were honored guests for 2017’s show. 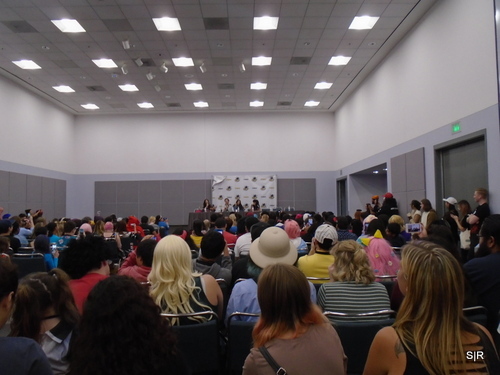 On Sunday, there was a Steven Universe panel that filled up the entire room of SU fans. Fans praised the cast of SU’s themes of inclusion and representation. Michaela (Amethyst) talked about her adoption story. She is an adoptee from Korea. Dee Dee also talked about her theater background starring in Miss Saigon on Broadway. There were a few sing alongs and Q&A from the audience. 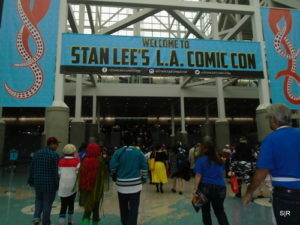 This was a great way to meet SU fans and get to know the cast on a personal level. 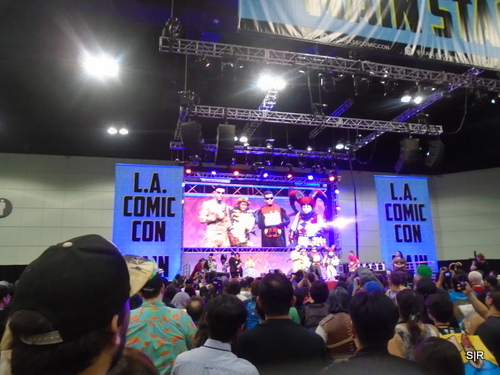 After the panel, the cast had signings in the dealers hall. Michaela and Dee Dee charged for selfies and signings. Because I’ve been following Dee Dee since her MMC days, I bought an autographed print and got a selfie with her. It’s not every con I have the opportunity to sit in on Disney theme park trivia. Bob Gurr and Garner Holt, veteran Disney imagineers, talked about how they got into Imagineering as well as behind the scenes. Not only they talked about their experience at Disney, they also talked about their work at other parks. For any Disney parks fan, this was an insightful panel learning about what goes into creating park attractions the Disney way. A little imagination goes a long way! 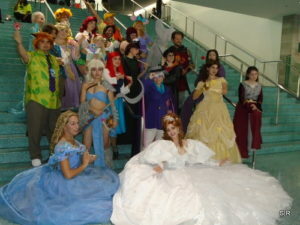 Traditionally, the Disney cosplay meet up took place on Sunday by the stars towards Kentia Hall. We had a much more humble group this year. We did get a few Disney Afternoon characters show up. I went as Briar Rose and joined in for princess and classic Disney photo ops. However, the gathering had to be cut short because I had a creeper situation who was extremely aggressive about getting a selfie with me. Though LA Comic Con has plenty of “cosplay is not consent” signs, there are people out there who won’t take “no” for an answer. Thankfully, I got out of there quick. If you saw me with an aura that was a raging fire, my kind apologies. I have zero tolerance for people who cannot take “no” for an answer. The most famous man involved with comics and the head of this convention opened Sunday morning with an informal interview and speech. He talked about his cameo roles in various comic book movies. He gave mostly joke answers to questions about the creative process making this a fun presentation. Despite his hearing issues he did take questions from the audience. He was very serious when it came to the difference between ‘comicbooks’ and ‘comic books’ as the first are works of art with entertaining stories while the second set are book that are funny. The final word of advice was that when given the option to be a good guy or bad guy choose good guy because people will like you and in the end you will win.